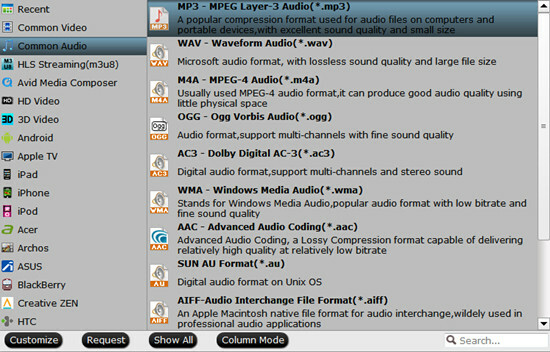 Need to convert AIFF to MP3 on Windows or Mac? You can free download AIFF to MP3 converter to get your job done. Audio Interchange File Format (AIFF) was developed by Apple in 1988 and is most commonly used on Apple Macintosh computers. It is a leading audio format used by professional level audio and video applications as it is superior in quality to its more popular lossy MP3 format. AIFF is lossless and uncompressed meaning it takes up around 10mb for every minute of audio at 44.1kHz. MP3 is a digital music format which allows CD tracks to be reduced to around a tenth of their normal size without a significant loss of quality. MP3 gets rid of a lot of the information recorded in a song that our ears are not able to hear and then uses complex algorithms to reduce the file size. This then enables you to get hundreds of songs on to a CD and it also has opened up a new market over the internet – the download market as download times have been significantly reduced. AIFF files can be opened with Windows Media Player, and likely many other multi-format media players. You can just listen to the music with AIFF on your computer with the player mentioned. However, in case you will enjoy this music on other multimedia devices which don’t support AIFF, you have to convert to other audio formats, usually, MP3 format. To successfully convert AIFF to MP3, a strongly recommended solution is Pavtube Video Converter (Mac version), which is extremely powerful and professional yet easy-to-use. It is the all-in-one audio conversion software, especially the conversion from AIFF to MP3, which can help you convert AIFF to MP3, convert audios among WMA, WAV, AAC, FLAC, OGG, APE, etc easily with excellent music quality. Step 1: Download, install and run the corresponding program. Click “Add Video” or “Add from folder” to load your AIFF files. Step 2: Click the “Format” bar and select “Common Audio>>MP3- MPEG Layer-3 Audio (*.mp3)” as output format.